Trespassing is unauthorized entry onto land, although it can also refer to injury caused to another person. Neither malicious intent nor knowledge of one’s actions is necessary to commit the crime of trespassing. While property owners have the right to prevent trespassing, and to bring complaints against those who trespass uninvited, generally they cannot use force to remove them or protect their property. 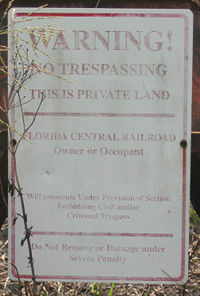 Trespassing (of land) is a controversial topic in several countries. Many scholars in the past such as Karl Marx and Jean-Jacques Rousseau believed that land could not be owned as private property, and that trespassing should not be a legitimate complaint. Some religious views, too, regard land as owned by God, and that while we may have the responsibility of stewardship over it, the land does not belong to us. While the right to privacy and protection from harm by others is a legitimate human right, the laws of trespass may have overstepped these rights and given too much protection to the owners of property. The rights of way common in the United Kingdom reflect the view that the public is naturally authorized to pass through property that may be privately owned on their way to public places provided this is along paths that have commonly been accepted to constitute public access. There must be balance between ownership, or stewardship, of property by individuals and the rights of society as a whole to enjoy and appreciate the earth and all its beauty. 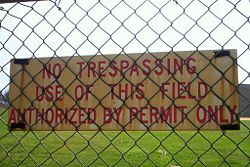 In law, trespass can be the criminal act of going into somebody else's land or real property without permission of the owner or lessee or a civil law tort that may be a valid cause of action to seek judicial relief and possibly damages through a lawsuit. In some jurisdictions trespassing is an offense or misdemeanor covered by a criminal code. In other jurisdictions, it is not considered a crime or penal in nature; rather, property is protected from trespass under civil law and privacy acts. Although criminal and civil trespass laws vary from each jurisdiction, most have the following facets in common. Not all persons seeking access to property are trespassers. The law recognizes the rights of persons given express permission to be on the property ("invitees") and persons who have a legal right to be on the property ("licensees") not to be treated as trespassers; for example, a utility meter reader on the property to read the meter. A police officer or process server seeking to execute a warrant is an invitee. Someone such as a door-to-door salesman or missionary (a Jehovah's Witness or Mormon for example), would be a solicitor and not afforded the invitee exclusion to enter, and therefore be a trespasser. Most, though not all, jurisdictions allow "benevolent trespassing" for extreme situations. For example, a person involved in a car accident where somebody is injured may legally enter another's property to secure help. The law assumes people will make a reasonable effort to notify property owners if possible. Similarly "Good Samaritan" laws take precedent over property laws where applicable. Civilians are afforded certain protection in emergencies—people cannot generally sue their would-be rescuers for breaking ribs attempting CPR, or damaging property while helping a person in need. Property owners may allow some trespasses while excluding others. For example a sign saying just "No Hunting" could conceivably allow hiking, snowmobiling, or bird-watching, but would give notice to hunters that they would be trespassing if they entered onto the property. Trespass is not limited to human beings. For example, the owner of cattle or dogs may be responsible for an animal's trespass in some jurisdictions. Similarly, if a person cuts down a tree and it lands on a neighbor's property they are liable for any damage. Most jurisdictions do not allow "self-help" to remove trespassers. The usual procedure is to ask the trespassing person to leave, and then to call law enforcement officials if they do not. As long as the trespasser is not posing an immediate threat, they cannot be removed by force. It is usually illegal to arrest a trespasser and hold them on the property until law enforcement arrives as this defeats the purpose of allowing them to cure the trespass by leaving. Property owners and their agents (for example, security guards) may use only reasonable force to protect their property. For example, setting booby traps on a property to hurt trespassers or shooting at trespassers are usually strictly forbidden except in extreme circumstances. A notable exception is the U.S. state of Texas, where it is legal to use force against trespassers after dark. Trespass to land is a common law tort that is committed when an individual intentionally, or in some jurisdictions negligently, enters the land of another without lawful excuse. Trespass to land is actionable per se. Thus, the party whose land is entered may sue even if no actual harm is done. In some jurisdictions, this rule may also apply to entry upon public land having restricted access. A court may order payment of damages or an injunction to remedy the tort. In most jurisdictions, if a person were to accidentally enter onto private property, there would be no trespass, because the person did not intend any violation. However, in Australia, negligence may substitute the requirement for intent. Thus, in that country, even if a person trips and rolls upon the land of another for want of due care, he or she could be found to have committed trespass. If a trespass is actionable and no action is taken within reasonable or prescribed time limits, the land owner may forever lose the right to seek a remedy, and may even forfeit certain property rights. The maxim cuius est solum, eius est usque ad coelum et ad infernos ("whoever owns the land owns it all the way to the heavens and to hell") is said to apply, however that has been limited by practical considerations. For example, aerial trespass is limited to airspace which might be used by the property owner (therefore airplanes cannot be sued). The courts have been more lenient with underground trespass. The asymmetry between aerial and underground trespass may be resolved by the fact the ground is almost always used (to support buildings and other structures) whereas airspace loses its practical use above the height of skyscrapers. Some cases also provide remedies for trespass not amounting to personal presence, as where an object is intentionally deposited, or farm animals are permitted to wander upon the land of another. Furthermore, if a new use of nearby land interferes with a land owner's quiet enjoyment of his rights, there may be an action for nuisance, as where a disagreeable aroma or noise carries over into another's property. As with other intentional torts, the defenses of necessity and consent are available for trespass to the person. Assault and battery are trespasses to the person and actionable in tort as such. The unlawful interference with the goods of another is a trespass against his goods, and actionable in tort, usually as conversion or detinue. Actions for breach of contract were developed by the common law courts out of trespass and came to be called "trespass upon the case." A sign warning against trespassing at Mater Dei High School in New Jersey. There are many methods land owners use to prevent trespassing, usually depending on the terrain, risk, importance (personal, cultural, or economic), and size of the property. Some of the most common are also the most basic—barbed wire, warning signs, and fencing. Marking property as private property can be done in a variety of ways. The most obvious way is to put up a sign saying "No Trespassing" or "Private Property." However, a continuous fence has the same effect in most places. 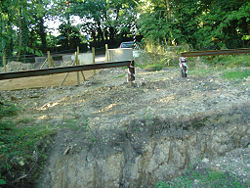 Many jurisdictions allow the use of markers when fencing would be impractical or expensive. For example, Ontario, Canada allows the use of red paint on landmarks such as trees to mark the boundaries of private property. 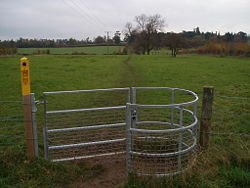 "Kissing gate" with yellow footpath markings. In the United Kingdom, public rights of way are paths on which the public have a legally protected right to pass and re-pass and thus are not trespassing, even though the land may be privately owned. Public footpaths often form a dense network of short paths, offering a choice of routes to many different destinations. It is probable that most footpaths in the countryside are hundreds of years old or more. The law differs in each of the constituent countries: notably, in England and Wales rights of way only exist where they are so designated (or are able to be designated if not already); in Scotland, any route that meets certain conditions (such as a defined route over which the public has been able to pass unhindered for at least twenty years and which links two "public places" such as villages, churches, or roads) is defined as a right of way, and in addition there is a general presumption of access to the countryside. 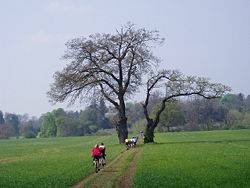 The various public rights of way include footpaths, permissive paths, bridleways, and byways. The rights of way are distinguished by the method of travel permitted on each, which ranges from foot to horse to vehicle. While property laws around the world are fairly clear, there is still a question as to whether or not the laws themselves are legitimate. Certain sects of naturalists argue that one cannot own anything on the planet. These people argue that private property is unnatural and can only lead to conflict as people fight over natural resources. Karl Marx and Jean-Jacques Rousseau both believed that man was ruined as the result of personal property. [True] communists believe that all property should be held in common among members of a society. Many Native American tribes also had no concept of private ownership of land, which sadly resulted in exploitative exchanges with European settlers, such as the island of Manhattan for a collection of beads. Historians have noted that property laws are inherently classist. They put farmers (property owners) and animal herders against each other. As farmers fence in their property it hinders the work of the herders, whose animals need to roam in order to graze. Requiring farmers to bear the burden of building fences has led to overinvestment in animals, as herders do not have to pay to feed them when they can roam on public land. The religious concept of stewardship suggests that the world is of divine origin and thus the land and all that exists here is not to be owned by us, but that we are the "stewards" who are to take care of it while it serves all our needs. In Islam, it is God who is the final authority over all of creation, arranging for all things to satisfy our needs: "Do you not see that God has subjected to your use all things in the heavens and on earth, and has made His bounties flow to you in exceeding measure, both seen and unseen?" (Qur'an 31.20). Stewardship in Christianity follows from the belief that human beings are created by the same God who created the entire universe and everything in it. The basis for the concept of stewardship is found in Psalm 24:1: "The Earth is the Lord's and all that is in it, the world, and those who live in it." To look after the Earth is the responsibility of the Christian steward, but ownership belongs to God: "To the Lord your God belong the heavens, even the highest heavens, the earth and everything in it" (Deuteronomy 10:14) and "The land must not be sold permanently, because the land is mine and you are but aliens and my tenants" (Leviticus 25:23). From this perspective, God, the true owner of all property, could accuse human beings of trespass and hold us liable for damage done to the earth, if we were considered unwelcome. ↑ Texas Penal Code § 9.42 Texas Legislature. Retrieved August 17, 2007. ↑ Forfeiture Endangers American Rights FEAR. Retrieved August 17, 2007. This page was last modified on 16 December 2015, at 16:47.